I see from dropping in at Bibliotropic that Mark Lawrence has organized a second round for his self-published fantasy novel blog-off. Let’s see — looks like 300 entries, all either stand-alones or first in a series. Ten bloggers are participating, so for the first round, every blogger gets 30 books. How they deal with all those is up to them, except they have to put just one forward as a finalist. Ria at Bibliotropic is starting off by just taking a look at her thirty, six at a time — title, cover, back cover. She’s got eighteen up so far. Pretty, colorful. The woman’s expression is perhaps a bit vapid, but on the other hand, she *is* holding a lute. I definitely prefer this to a lot of the darker, more monochromatic covers. I don’t remember exactly who participated last year, but I certainly see several I know did. Bookworm Blues is also taking an initial look at cover art. 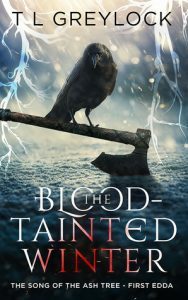 For hers I lke the cover and title for The Blood-Tainted Winter, though the book itself might well be too grim for my taste. BiblioSanctum has a brief introductory post up, showing thumbnails of all thirty of their titles. That really shows you how hard it can be for a cover to stand out amid a whole bunch of tiny little thumbnails. I will click through to just one . 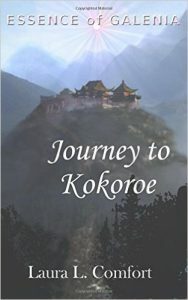 . . all right, I rather like this one: A Journey to Kokorue. The others don’t seem to have done introductory posts yet. Well, I’ll try to remember to check in from time to time and see what’s going on with this. I did pick up a couple of titles from last year’s SPFBO, but (of course) haven’t actually read them yet . . . maybe I will manage to do that before this year’s finalists are chosen. I enjoyed following the last one of these, but I’m not into grimdark and that sort of thing seemed to dominate their top 10, so I lost interest. Hopefully there’s more variety in their final round picks this time. 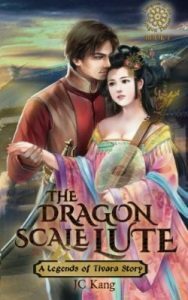 Did you end up reading any of last year’s spfbo entries? I read The Thief who pulled on Trouble’s Braids (liked that one, but book 2 made me not want to bother with book 3) and A Soul For Trouble (finished that series). I picked up one of the Thief ones; I don’t remember which one. Maybe both! I like thieves and as I recall both sounded fairly promising. And also Blood Rush by Ben Galley. But none of them have shuffled to the actual top of my tbr pile yet. Honestly, I’m terrible about actually *reading* the titles that are safely waiting on my tbr pile. I will try to whittle the pile down a bit now that I’ve finally sent Dark Turn off to my editor.